Pellegrino makes a few changes from the Arsenal game, it’s disappointing to see Hojbjerg back on the bench, although Lemina and Romeu are a pretty good pairing in central midfield. I hoped that it would give Saints a solid foundation in theory, but it doesn’t turn out that way as Leicester repeatedly find gaps between the Saints midfield and defence, causing havoc and creating chances at will. After a fairly bright start for Saints, a Leicester break brings a pretty soft goal from Saints point of view. First van Dijk is slow to react to a loose ball near the half way line, allowing Okazaki to drive into the Saints half where he finds Mahrez. There still doesn’t look a lot of danger with a lot of red and white shirts between him and the goal, but Lemina slips as he tries to close him down and despite a Mahrez slip of his own the Leicester player is still able to retain possession. He moves unchallenged across from the right and hits a low shot into the corner of the net from outside the box. A frustrating goal to concede with several players who might have defended better, a pattern that was to continue through the match. The goal gives Leicester a lift and Saints struggle to get back onto the front foot, shots from distance from Okazaki and Ndidi both need saving by Forster. Then Leicester do beat Forster as another pacy attack cuts through a soft centre, but Okazaki’s low shot is brilliantly blocked by Lemina on the goal line. 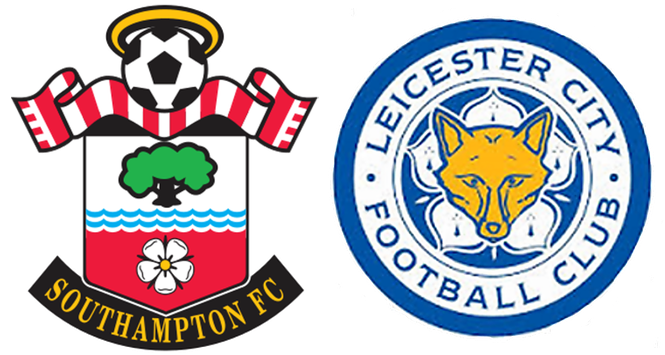 It’s a warning for Saints who are faced with a resolute looking Leicester defence, Boufal finding it difficult to get much change out of Simpson and Ndidi, while other Saints players are looking sloppy in possession compared with the efficient and lively Leicester players. It’s nearly half an hour in before Saints make a proper threat on goal, Lemina initiating a sharp move that ends in a powerful Austin shot that Schmeichel tips over. Schmeichel then gathers the corner and immediately releases Mahrez, a cross finding Vardy who forces an excellent point blank save from Forster. Then from Leicester’s corner they finally do get their deserved second goal, Fuchs’ shot is blocked and falls to Okazaki 6 yards out, he sticks it away easily. After 33 minutes I’m calling this as Claude Puel’s best performance at St Mary’s. I don’t buy it that it’s just the players, Saints just never played with this kind of zip last season and that does come from the manager’s influence- this is more evidence that he wasn’t a fit at Saints. The third goal is a shocker for Saints. Harry Maguire takes a Mahrez free kick on his chest and turns like he’s Zidane (he’s not Zidane, he’s just allowed acres of room by Bertrand) and plays a ball across the face of goal. Nobody cuts it out and it falls to King at the back post, who can’t miss. Gary Birtles on commentary sees a picture of a glum looking Puel and says he doesn’t look that happy for someone 3-0 up. Gary, he always looks like that. Van Dijk blazes a volley over the bar to cap a miserable half from Saints. The 3-0 half time lead is the least that Leicester deserve, better than us in all departments. With Gabbiadini replacing Romeu at half time, Saints have a ‘seen them given’ penalty shout as Morgan leans into a Boufal cross, but only get a corner. Lemina continues to look out of sorts, easily dispossessed in his own half, meaning Austin has to concede a free kick that Mahrez makes Forster tip round the post, then Maguire does another Zidane impression, waltzing through and forcing another Forster block, honestly, wtf if going on? Then Saints come to life. Bertrand has a decent go from a free kick that Schmeichel turns over the bar and from the corner Yoshida nods down- Tadic has a swing at it that he claims is the vital touch to turn into the net from close range. Either way it’s a goal that Saints haven’t really threatened until now. And almost immediately Saints nearly make the game very interesting, substitute Redmond releasing Bertrand who puts it on a plate for Austin, he should give Schmeichel no chance but scuffs it from close range to allow the keeper to block. Then Leicester do kill the game off, Vardy running the channels after Cedric gave the ball away cheaply, Vardy’s cross from the right finished first time by Okazaki, 4-1. Both sides settle for that as a final score, a great result for Leicester although if anything the scoreline flatters Saints. It’s a shocking performance and undoes a lot of the good work Saints had done in the weeks since the previous nadir against Liverpool. I was coming around to Pellegrino before this game, but he has to make the team respond quickly or he’ll have Saints fans calling for change again.